With headquarters in Hamburg, Jungheinrich, a leading company internationally in the areas of industrial truck and warehouse systems and material flow technology, offers various tow tractors in its extensive product range which are already in use at international airports, such in Vienna. 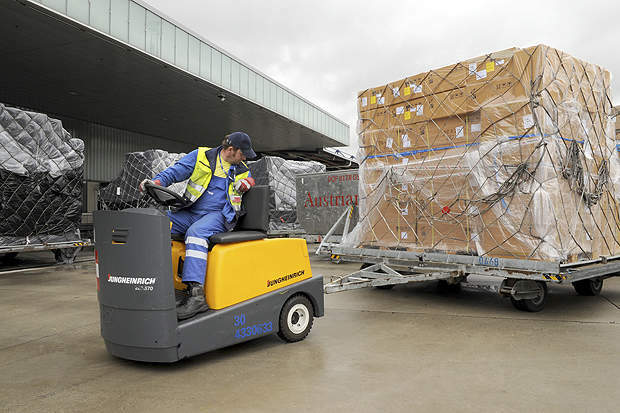 Jungheinrich tow tractors there ensure among other things that incoming air freight is handled quickly and correctly. An amazing amount of technology comes together in airports, and that extends well beyond the impressive array of aircraft. Equally interesting is the question: How does it always happen that one piece of baggage or air freight among untold thousands of others arrives at precisely the destination that we ourselves have reached? 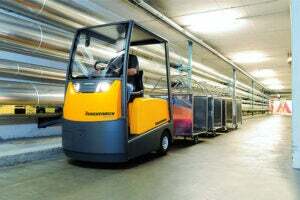 In addition to recording a barcode and the unique assignment based on it, including the ability to track luggage and air freight, a sophisticated conveyor system and tow tractors for transport play a considerable role in handling luggage at airports. Tow tractors type EZS 570, in continuous use at Vienna Schwechat airport since 2009, are sturdily built and ready for the most demanding tasks, indoors and out: They feature an 8mm thick chassis made of steel sheet and a housing manufactured from an extremely durable plastic. 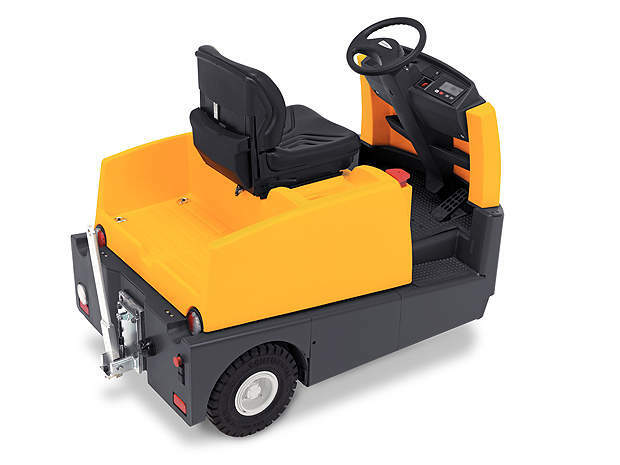 The chassis skirt is drawn up extra high on the front cover, which not only provides safety for the driver but also represents a visual highlight of this Jungheinrich tow tractor. Attaching several trailers together makes it possible to vary the load surfaces of Jungheinrich tow tractors in numerous ways. The vehicle can be equipped with a wide range of couplings, making it easily adaptable to almost any type of trailer. The coupling itself can be clearly seen by the driver from any position and is also easily accessible. An optionally available semi-automatic remote unlocking of the coupling allows the operator to hitch and unhitch the trailer without leaving the operator platform. This also makes for a faster overall transport process, which is exactly what the traveller at the baggage conveyor wants. The versatile and economical vehicle is able to move trailers with a gross weight of up to 7t. 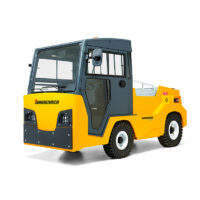 Jungheinrich also has a "large" tow tractor in its product range. 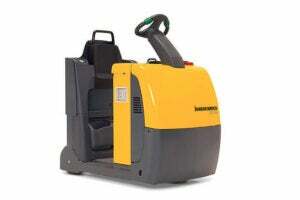 The EZS 6250 is even able to transport loads weighing up to 25 tons – especially in outside areas and over long distances. And in confined situations, the "smaller" Jungheinrich tow tractors type EZS 130 and 350 can stand their ground with a capacity of three to five tons – even in international airports. Jungheinrich is one of the world’s leading companies in the industrial truck, warehousing and material flow technology sectors. Since 1953 the company, with its headquarters in Hamburg, has been providing its customers with products and services for a wide range of truck needs. As a manufacturing provider of services and solutions for internal logistics, the company provides close support for its customers with a comprehensive product line of stackers, racking systems, services and consulting. Jungheinrich’s direct sales network in Germany consists of 17 regional sales centres and representations. The company has its own sales and service companies in 30 other countries worldwide. Throughout Europe alone it has around 100 facilities, from Norway to Turkey and from Finland to Portugal. The company also has a dense dealership network in many other countries such as in North and South America, the Near East, South Africa, India and Australia. The company achieved sales of more than 1.6 billion Euros in 2009 with roughly 10,200 employees. Jungheinrich shares are traded on all German stock exchanges. Looking for an Efficient and Flexible Transport Solution for Your Logistic Routes? We can provide you with tow tractors and entire tow trains with drawbar pull capacities of up to 25,000kg. Repetitive procedure every day? Based on a defined route, the tow train follows the milk run principle as it moves from one station to the next.